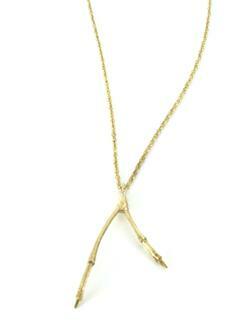 14k gold large double branch on 18" rope chain. kria, n (sterna paradisaea) migrates farther than any other bird and in known for ferocious protection of breeding grounds. The inspiration for Kria appeared on a black lava beach in eastern Iceland in the summer of 2006 when Jóhanna Methúsalemsdóttir found a skeleton of the bird by the same name nestled in the sand. The birth of her second daughter, Lóla Salvör, came soon after as did the birth of the Kria collection and both are growing. Kria was officially founded in 2007 while Jóhanna was experimenting with the re-contextualization of elements of the natural world through jewelry. 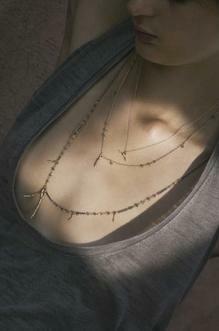 In an effort to integrate the shapes of organic objects such as bones and branches with the shapes of the human body, she began a fresh illumination of the grace of evolutionary design with the Kria collection.